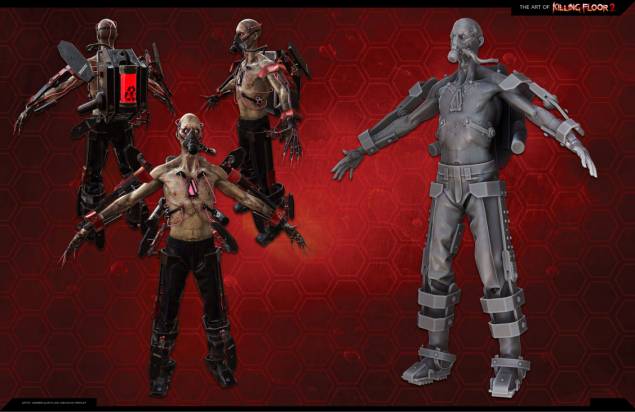 Hans Volter is one of the four bosses faced at the end of a standard Killing Floor 2 survival game By defeating him, the game ends and the team is presented with a sizeable XP bonus as well as encouraging music and a message reading "your squad survived". He bears the image of a disheveled old man, naked save for a pair of trousers and an exo-suit of Horzine technology that sustains his life as well as augmenting him with many powerful capabilities. He carries two StG-44 assault rifles, and wears a gas mask that seems to have melded with his flesh in some way. He appears to have a vast amount of health, which often leads to a long and potentially deadly battle. Great care should be taken when dealing with this enemy. Hans Volter does not have head health as he cannot be decapitated. Under normal circumstances it is impossible to do anything with the bounty earned from killing Hans Volter other than to throw it around in post-victory idle time. Hans Volter has his health value scaled accordingly to the number of players in the game. This increase in value is massive per player. 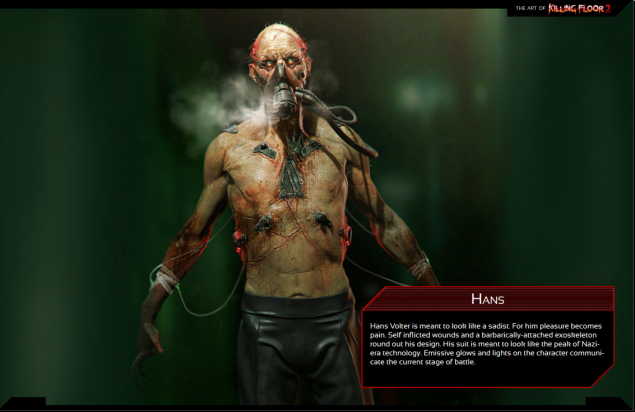 Hans Volter's base health value is 5268 on Normal, 6084 on Hard, 6307 on Suicidal, and 8013 on Hell on Earth. This value is determined by the number of players that are alive when Hans Volter spawns. Damage type group (per attack type) Ballistic, Explosive, Slashing, Toxic. When Hans Volter's HP drops to certain thresholds (60%, 41% and 25%), he will put up a protective shield surrounding his body. This shield will absorb all damage done to him while it is active and render all incapacitating effects useless until the shield is destroyed. After the shield is active Hans will toss a barrage of smoke grenades to obscure the team's vision and his position. He will then run away for a few seconds. After running away Hans will charge back into team and attempt to grab a player to drain their HP. If Hans successfully grabs a target he will recover a huge amount of HP over approximately 5 seconds. This value is a percentage of his max HP, depending on what phase he is on. Hans will recover 32.5% HP for Phase 1, 27.5% HP for Phase 2, and 12.5% HP for Phase 3. Throughout the Hunting Phase, Hans' shield can be destroyed with enough firepower. The shield's HP value depends on the current phase, difficulty and the number of players. Note that if Hans has grabbed a player, it does not mean the team has completely failed to stop him from healing; Players can still salvage this by continuing to shoot at him as he drains his target. Hans takes around 5 seconds to complete this attack, and the shield can still be broken while he is draining the target. He may recover some health, but it is better than allowing him to complete the drain and recover a quarter of his health. Successfully destroying Hans' shield will end the Hunting Phase and prevent him from healing. Cannot sprint if Hans Volter has a player in sight and has his guns drawn. Will sprint if he loses sight of players and has his guns drawn. Will sprint when guns are kept and he switches to melee or throwing grenades. Will immediately stop any action and sprinting once shielding activates. In multiplayer (when there is more than 1 player at server) Hans Volter will gain 20% bonus movement speed every minute if only one player is left alive, up to a cap of 30%. He will also gain the ability to break down unwelded doors by running into them. Hans Volter greatly resists some forms of damage and is vulnerable to many other forms. Hans Volter has a unique weakness to the RPG-7's explosive damage. Hans Volter equally resists all forms of ballistic weaponry but is slightly more vulnerable to the Sharpshooter's rifles. 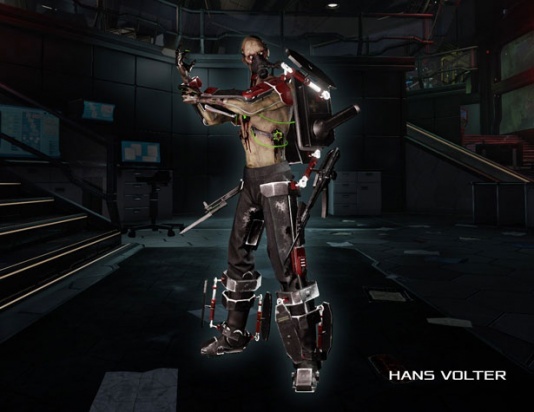 Hans Volter has 3 weak spots, 2 of which are power cores located on his backpack and his chest. His last weak spot is his head. His arms and legs are vulnerable spots, but his claws deflect damage. 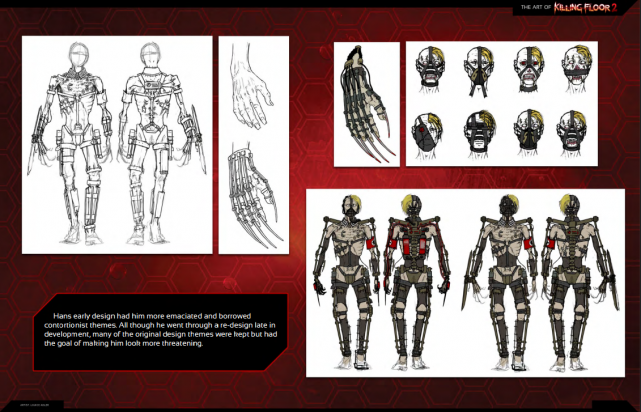 His metallic Exo Suit acts as crude armor and will reduce damage taken when it is shot at. Hans cannot teleport nor get frustrated. Damage to doors = 300 / 1500. Should NOT sprint while holding guns AND when enemy within (3-40 (3-30 when there is only one player alive) meters range) OR while holding guns in phase 0. Otherwise should sprint. Chance to block after taking damage: Suicidal, HOE - 0.3. Health loss percentage to trigger block - 0.1. Block chains (max): Suicidal - 5, HOE - 6. Block duration - 1.25s, cooldown - 7s (Suicidal), 6.5s (HOE). Affliction multiplier - x0.2. Damage multiplier (melee, firearms) - x0.7. Only allowed to block while in melee phase and not in Hunt and Heal mode. Hans Volter will flee away after pulling out its shield. Flee duration is random (5-6) seconds, maximum distance to travel - 30 meters. After that it will enter Hunt and Heal mode. Breaking the shield cancels Hans Volter's Flee / Hunt and Heal mode and knocks it down. Shield shatter explosion: Damage - 30, Radius - 500, Falloff - 1 (linear). Hans will not drain anymore of player's health if it at this amount: Normal - 70%, Hard - 45%, Suicidal - 35%, HOE - 25% (of the max health). Health drain happening within 0.25s intervals. Cooldown after Health Drain attack - 2.5s. Mimimum interval between grab attacks - 2.5s. Evaluation of grab attack possibility does not happen if Hans' victim is falling / airborne. Maximum grab distance - 3.5m. Grab attack cannot be blocked or interrupted. 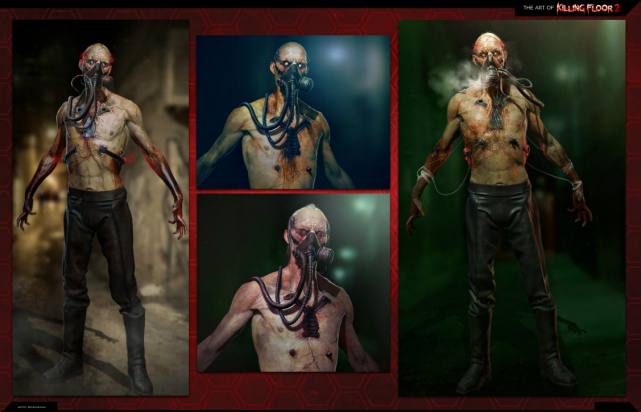 Variety of ZEDs to spawn during the Hunt and Heal mode changes with the game difficulty. When running Hans can do bump damage to other ZEDs. Hans Volter will cancel its Hunt and Heal mode and will heal off of the players after bumping into them for few times. When Hans Volter perform his grab attack all nearby ZEDs will be knocked off of the way. ZED summoning lasts for 30 seconds after reaching listed health percentage and can be also ended earlier if Hans Volter has healed. ZEDs spawned during the Hans Volter's wave are always frustrated. Shield health color: >75% - green, between 75-50% - yellow, less than 50% - red. Grenade attacks, up to: Normal toss - 2 grenades, half-barrage - 5 grenades, barrage - 7 grenades. Grenade damage does is NOT affected by game difficulty modifiers. While in Hunt and Heal mode Hans can do bump damage to ZEDs nearby players. Base amount of the damage is 270 x (ZED Bump scale). This damage value will also be multiplied by Hans' difficulty damage modifier. For all ZEDs bump scale - 1 (for Scrake - 0.1, for Fleshpound - 0). If bumped ZED has less health than damage given by Hans' bump there is 40% chance for this ZED to die and 60% chance to get knocked down without taking any damage. If amount of damage given by bump will be less than amount of ZED's health, bumped ZED will be damaged and stumbled. Damaged ZED will consider his bumper as an enemy if damage given by bump will be at least 15% of ZED's maximum health. 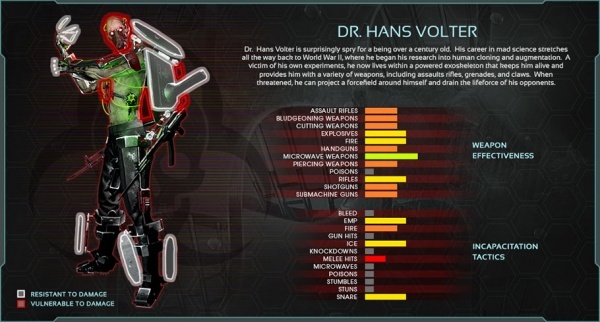 Hans Volter cannot hurt itself with its own HE and Nerve Gas grenades. Hans not allowed to throw grenades for the next 5 seconds after equipping the guns. Hans not allowed to shoot for 1 second after equipping the guns. Amount of the bullets per MKb42 burst is random between (3-8). Mimimum time between bursts - 0.5s. Minimum distance from the target player to start shooting - 3 meters , maximum distance - 40 meters (30 when there only one player alive in the multiplayer game). In multiplayer game, when only one player alive for every minute spent Hans Volter will be getting additional +20% movement speed, up to +30% movement speed total. Hans Volter has an ability to destroy closed unwelded doors just by running (bumping) into them. Sprinting required. Can do "frenzy" melee attacks - no, Sprinting behaviour - no, Global grenade toss cooldown - 25s, Can toss nerve gas - yes (cooldown - 10s), Can toss nerve gas barrage - no, Can use guns - yes (max duration to use - 9999s), Can toss HE grenade - no, Can toss HE grenade barrage - no. Can move while tossing grenades (Normal / Hard / Suicidal / HOE) - No / No / No / No. Hunt and Heal threshold (Normal / Hard / Suicidal / HOE) - 60% / 60% / 60% / 60%. Health restored, of max health (Normal / Hard / Suicidal / HOE) - 32.5% / 32.5% / 32.5% / 32.5%. ZED summoning begin when HP at (Normal / Hard / Suicidal / HOE) - 78% / 78% / 78% / 78%. Can do "frenzy" melee attacks - no, Sprinting behaviour - yes, Global grenade toss cooldown - 25s, Can toss nerve gas - yes (cooldown - 20s), Can toss nerve gas barrage - no, Can use guns - yes (max duration to use - 10s, cooldown - 20s), Can toss HE grenade - yes (cooldown - 20s), Can toss HE grenade barrage - no. Can move while tossing grenades (Normal / Hard / Suicidal / HOE) - no / no / no / yes. Hunt and Heal threshold (Normal / Hard / Suicidal / HOE) - 41% / 41% / 41% / 41%. Health restored, of max health (Normal / Hard / Suicidal / HOE) - 27.5% / 27.5% / 27.5% / 27.5%. ZED summoning begin when HP at (Normal / Hard / Suicidal / HOE) - 59% / 59% / 59% / 59%. Can do "frenzy" melee attacks - yes, Sprinting behaviour - yes, Global grenade toss cooldown - 20s, Can toss nerve gas - no, Can toss nerve gas barrage - yes (cooldown - 20s), Can use guns - yes (max duration to use - 5s, cooldown - 20s), Can toss HE grenade - yes (cooldown - 10s), Can toss HE grenade barrage - no. Can move while tossing grenades (Normal / Hard / Suicidal / HOE) - no / no / yes / yes. Hunt and Heal threshold (Normal / Hard / Suicidal / HOE) - 25% / 25% / 25% / 25%. Health restored, of max health (Normal / Hard / Suicidal / HOE) - 12.5% / 12.5% / 12.5% / 12.5%. ZED summoning begin when HP at (Normal / Hard / Suicidal / HOE) - 43% / 43% / 43% / 43%. Can do "frenzy" attacks - yes, Sprinting behaviour - yes, Global grenade toss cooldown - 10s, Can toss nerve gas - no, Can toss nerve gas barrage - no, Can use guns - yes (max duration to use - 4s, cooldown - 30s), Can toss HE grenade - no, Can toss HE grenade barrage - yes (cooldown - 20s). Can move while tossing grenades (Normal / Hard / Suicidal / HOE) - no / no / yes / yes. Draws a pair of STG-44 Rifles and shoots at players in bursts for a specific duration. This duration is 9999 seconds for phase 1, 8 seconds for phase 2 and 15 seconds for phase 3 and 4. With rifles drawn, he can leap and slash twice with his rifle bayonets. With rifles drawn, he can perform a spinning attack slashing around him with his rifle bayonets. With rifles drawn, he can perform a forward leap and stabbing with both rifle bayonets at once. With rifles drawn, he can perform a stationary, multi-hitting jabbing attack with both rifle bayonets at once. With rifles drawn, he can perform a forward kick to knock players away from him. Can throw a pair of nerve gas grenades, phase 1 and 2 only. Can throw a pair of HE grenades, phase 2 and 3 only. Can throw a barrage of 4 nerve gas grenades, phase 3 and 4 only. Can throw a barrage of 7 HE grenades, phase 4 only. On Suicidal and Hell On Earth difficulties, he can throw grenades while running. He will usually attempt to run through the middle of the team while tossing grenades to his left and right. While sprinting, can leap and slash with both claws at once, dealing massive damage in a single hit. While sprinting, can slash multiple times with his claws while moving forward, locking onto his target. While sprinting, can perform a 2-hit combo, slashing with one arm, followed closely by the other. While stationary, can perform a powerful 5-hit combo to attack players in front of him. When surrounded by multiple players, he can expunge nerve gas around his body with an explosive attack that knocks players away. At certain health thresholds, Hans will immediately cease all actions and enter Hunting Phase. If Hans successfully grabs and drains a player during Hunting Phase, he will recover a huge amount of HP. While in Hunting Phase, he will summon lesser ZEDs to obstruct players from running away, until he has successfully grabbed a target. With rifles drawn, he can use his jetpack to hover quickly to the left or right to evade gunfire when shot at. Without rifles, he can put his claws in front of his face to block gunfire aimed at his head. When he is blocking, he takes 70% damage from all sources. Hans Volter begins every phase in "attack" mode, where he will attempt to use his weapons to shoot at players or throw grenades. He will always try to use grenades as soon as they come off cooldown. The team should be unloading all their weapons on Hans as he is shooting or tossing grenades, while keeping their distance and dodging grenades. Players in front of Hans should attempt to shoot his head or chest core, while players behind him should shoot his backpack core, which is a huge target. At 60%, 41% and 25% health thresholds he will enter "hunt" mode as he will chase a target in order to grab and drain their life energy. During this time shoot at him to break his shield and end the hunting phase. Successfully destroying the shield will knock Hans down leaving him open to gunfire for a few seconds and prevents him from healing. When a player is grabbed, immediately unload all the firepower you can on Hans. He may recover some amount of HP but if you can destroy his shield before he finishes the draining, you can cancel the attack and prevent him from recovering the full amount of HP the attack allows him to. Do not crowd around him to heal his target. If there are multiple players around him, he will release nerve gas around his body when he lets go of his target. He will drop his target after healing to full or if his shield is destroyed. His phase counter will increase by 1, all the cooldowns on his attacks will reset, his attack patterns and level of aggression will change. 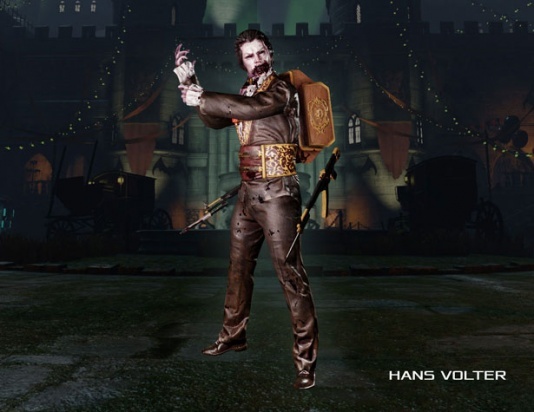 In Phase 1 Hans will never attempt to melee unless players get too close to him or are standing next to him as he finishes tossing grenades. 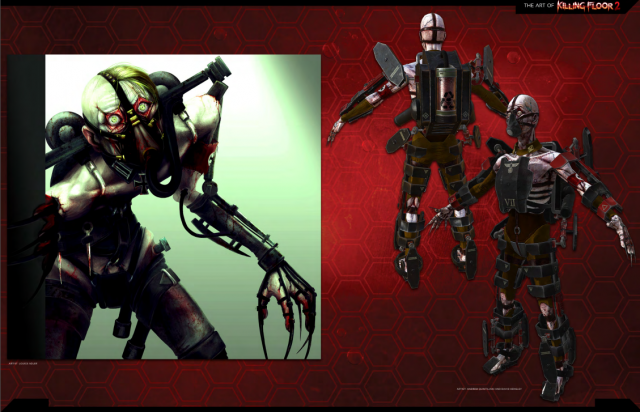 In Phase 2 Hans will begin tossing HE grenades which can kill players in one hit if they are unarmored and standing directly on top of one. Make sure to dodge grenades before resuming attacking. Hans also uses his guns the least in this phase and will attempt to melee with his claws more often. In Phase 3 Hans will begin throwing barrages of nerve gas grenades which can cover a big chunk of the battlefield in gas. Gun usage frequency resets to normal and he will only melee when his guns and grenades are all on cooldown or when players get too close to him. In Phase 4 Hans will begin throwing barrages of HE grenades. He will attempt to spread them out as much as possible while targeting one or two players in an attempt to trap them with explosives in every direction. Take note of where his grenades land and focus on getting out of immediate danger zones before thinking about attacking him or you might be killed very quickly. 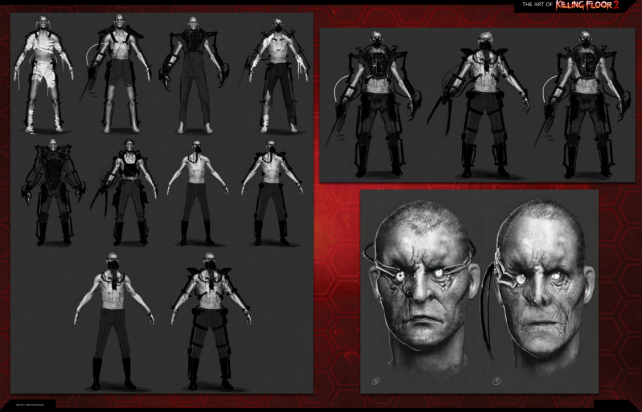 In Phase 4 Hans will throw grenades very frequently and use his guns less often, instead preferring to melee with his claws. This phase is extremely dangerous as losing track of his grenades or being targeted by his melee can lead to swift deaths. Keep your distance as much as possible. It is highly recommended for each team member to purchase the HMTech-101 Pistol before this fight begins as it will allow for the team to heal each other throughout the battle. Seeing as Hans puts out quite a substantial amount of damage, and the HMTech-101 Pistol is relatively inexpensive, this action can vastly help your team to survive. In the absence of a Berserker it is also recommended that some team members carry a melee weapon (such as a Zweihander, Pulverizer or Katana to parry Hans' melee attacks. Hans' melee attacks are the most powerful in the game and he can easily rip apart unarmored players in 2 hits and being able to defend yourself when Hans charges at you is important. Successfully parrying some of his attacks can stumble him and cancel his melee which may prompt him to use his guns or toss grenades instead.